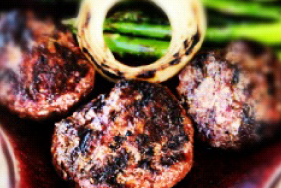 Pat the ground beef into 3-4 oz patties and cook as you prefer. If you have a grill, cook them to desired doneness. If not, a heavy cast iron skillet or grill pan over high heat works well. Sear on both sides, and then finish to desired doneness in the oven at 450. Toast buns, and top with grated cheese. Heat until melted. Top burgers with onions, tomatoes, etc, as desired. Brush a rimmed baking sheet with 1 tablespoon oil. Place potatoes on sheet in a single layer and brush tops with remaining 1 tablespoon oil. Bake until golden brown and crisp, flipping once, about 25 minutes. Remove from oven, season with salt, and serve. Not included in Large Real Food Boxes: Olive Oil, Salt, Pepper, and the optional ketchup, mustard, mayonnaise and burger buns.